At Rest: Gommecourt Wood, New Cemetery, Foncquevillers, Pas de Calais, France. War One. 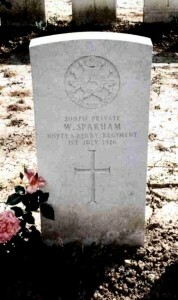 On one of the ‘Served’ Plaques, W. Sparham is listed, but beside his name, it is engraved ‘Killed 1916’. William Sparham was born in 1883 at Golden Valley, son of William Sparham, born 1843 Golden Valley and his wife Hannah (nee Smith). William and Annie married in 1870 and had a number of children:- Mary Ann b. 1873 at Greenwich, Ripley; Ellen b. 1876 Golden Valley; James b. 1877 Ilkeston; Agnes b. 1880 Golden Valley; as well as William b.1883. William’s father James was a coal miner/engine driver. In 1883, the same year William was born, his mother died so William was brought up by his father and elder sisters. In 1906 William married Eliza Ball b. 1877 South Normanton. In 1911, Eliza was living at Market Place, South Normanton with their two children, William and John Henry Sparham. Husband William is not at home on the night of the census. William enlisted at Ripley, Derbyshire on 19th October 1914 aged 30 years and 10 months. He was 5′ 5″ tall and place of residence was given as South Normanton. His army record notes that his wife Eliza had left him so he gave his next of kin as his sister Ellen Revill, a resident of Albert Avenue, Jacksdale. His brother James Sparham of Golden Valley and sister Agnes Porter of Woodborough, Notts are also listed. William was drafted to France in June 1915. 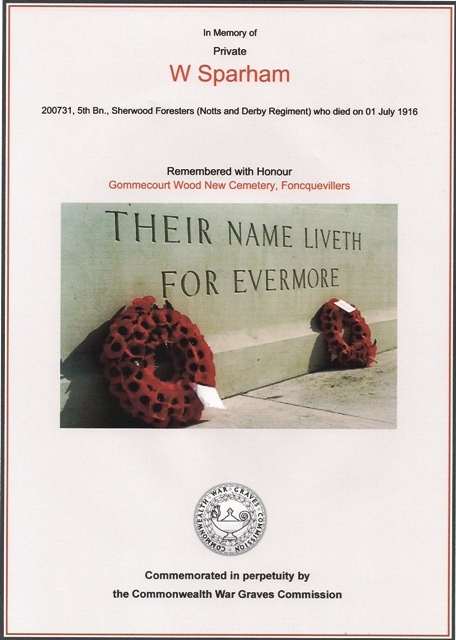 Just over one year later, on 1st July 1916, William was killed in action on the first day of the Somme offensive and is buried at Gommecourt Wood New Cemetery, Pas de Calais, France. He was awarded the 1914-15 Star, the British War and Victory Medals. When calculating his personal effects, army payroll noted he had a debt of £4 7s so nothing was sent to his wdow Eliza until July 1920 when a war gratuity of £7 1s was sent to her. 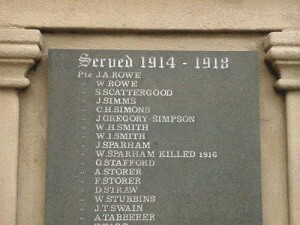 William’s nephew James Henry Sparham is also listed on the Jacksdale War Memorial as having served and survived WW1. During the Summer of 2001, Judith and Terry Kelsall, of Mackworth, Derby, were kind enough to take photographs of William Sparham’s grave during a visit to nearby Foncquevillers, whilst attending the 85th Memorial Service to commemorate the special connection which exists between the village of Foncquevillers and the city of Derby.Thanks also go to J & D Sparham of Nottingham who have provided further information.